I didn’t include the famous Chatterbox at Mandarin Orchard in my list because their chicken rice costs $27++ a plate. It would be unfair to judge a $4 hawker plate against it; it’s comparing pineapples and watermelons. But now, Chatterbox has opened an affordable outlet. The chicken rice here is $8. 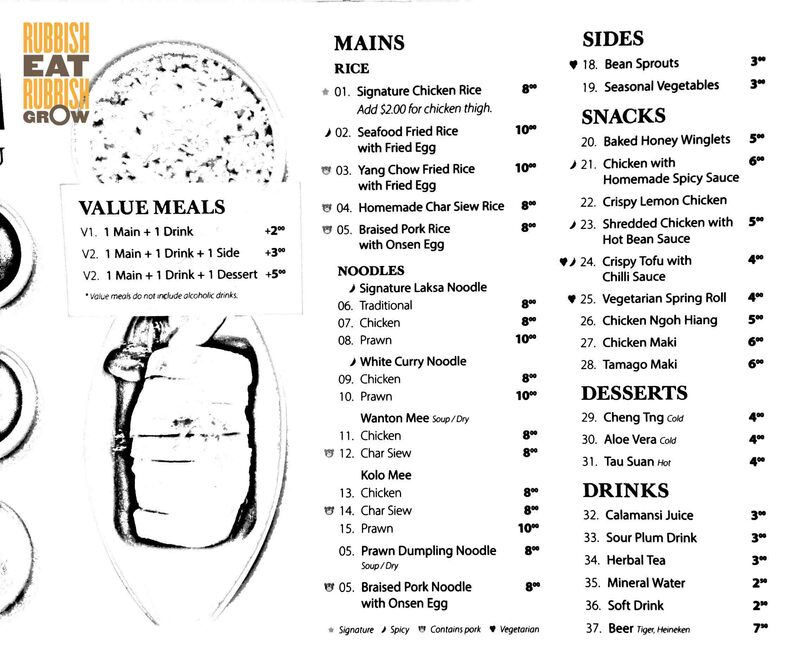 Mr Fitness asked, “Why is Chatterbox’s chicken rice priced at $27 but Express at $8?” Hm… I dunno. The skin is a gelatinous unami, sliding down the throat. The chilli is also good; tangy, spicy. Absorbing the broth fully, the rice is fragrant and buttery, but not greasy. Besides chicken rice, Chatterbox has another signature, the lobster laksa costs $38++. At Express, the laksa is priced at $8 (traditional or chicken) and $10 (prawns). Although not as good as the chicken rice, the laksa is very good too. The laksa is thick, slightly grainy, exactly how I like it. It’s moderately spicy, a good balance. It’s not very oily, so I could drink almost all of it. You can add $3 to the main to get a drink and a vegetable, or add $5 to get a drink and a dessert. We had the almond pudding, which is also excellent. (We suspect it may be catered but we are not sure.) The pudding is not as sweet as elsewhere’s, but it’s gao gao with the flavor of almond. On weekdays, you order, take a queue number, and wait for your number to be flashed on the screen. But we were there on a quiet Saturday. And the server was nice enough to deliver our food. Besides the good service, the wooden decor, almost like the 1960s coffeeshops in Singapore, is classy and comfortable. Mandarin Orchard’s two expensive restaurants, Shisen Hanten and Chatterbox, have opened more affordable outlets at Downtown Gallery: Chen’s Mapo Tofu and Express by Chatterbox respectively. Although these outposts are much more affordable, Mandarin Orchard does not compromise on the service, decor, and quality of the food. I welcome this change to make food more accessible to everyone and I wish all fine-dining restaurants can follow suit. We paid $24 for two persons at Express.